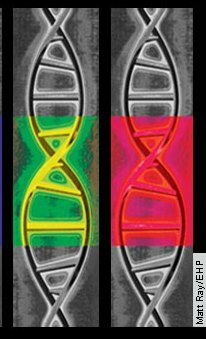 For all those out there who still think that ‘it’s all in the genes,’ here’s a recent news story on the way that changes in lifestyle can affect genetic activity. Will Dunham at ABC News brings us, Healthy Lifestyle Triggers Genetic Changes: Study (I also pulled it off the Reuters feed). The study was small, and I doubt that it was nearly as rigorous as really necessary, but the findings are interesting. The study was headed by Dr. Dean Ornish, head of the Preventive Medicine Research Institute in Sausalito, California. After checking out their website, I’m a bit more dubious than I was when I read the original news report (still no academic report or peer reviewed article on the study, so we’ll reserve judgment). The website demonstrates a dangerous tendency toward cult of personality and more than a bit of the ‘fad diet’ approach to health (for example, I’m sure pomegranate growers are psyched about the assertions that pomegranate juice can slow coronary problems, but I’m not persuaded yet to swap in my OJ for a PJ in the morning). Dr. Ornish writes a column for Newsweek and appears to be quite the health celebrity. Look, before I go any further, Dr. Ornish is probably the real deal, but, I think like a lot of researchers, I get a bit nervous around popularization of research. Dr. Ornish seems like a good guy, and if he’s getting people to take care of themselves, that’s great, but there’s a real tendency in the media, as we all know, for things to take off because of ‘personality’ rather than substance. I worry that it’s actually a dumbing down tendency imposed by the media producers themselves; a recent run-in with a local newspaper editor who was convinced that a story about our community had to be a ‘human interest story’ (read: colorful local person), only confirmed this suspicion in me. So apologies, in advance, to Dr. Ornish who is probably doing very good work, both in his clinic and through the media; if he’s a solid researcher, he’s probably as anxious to get the peer reviewed reports of his results out as I am to read them. Whether or not the research findings turn out to be credible (the number of genes also seems to oddly specific to me), the results shouldn’t surprise us: we know that diet, exercise, stress, and other lifestyle factors affect our health and physiology. For this to be the case, they have to have cellular-level effects, and since we know now that genes can be encouraged to produce proteins and blocked from being productive depending upon the cellular environment, this is the likely mechanism that we would find. This entry was posted in Food & Eating, general, Genetics, Medical anthropology and tagged diet, Genetics. Bookmark the permalink. Thanks for valuable post. Lifestyle can kill you or give you a lift. Make you or break you.